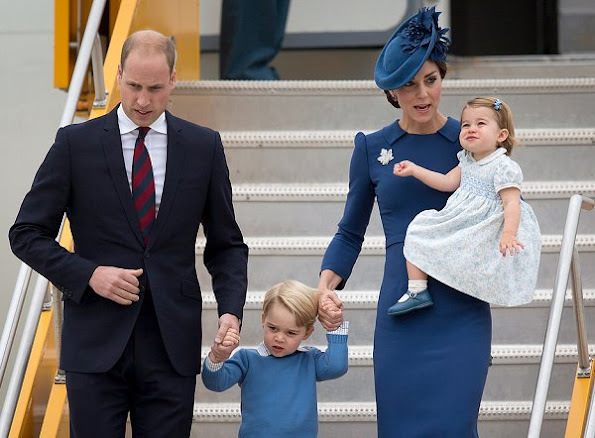 Prince William, Duke of Cambridge and his wife Catherine, Duchess of Cambridge along with their children Prince George and Princess Charlotte arrived in Victoria, British Columbia, Saturday, Sept. 24, 2016. Duchess Catherine wore a bespoke blue dress by designer Jenny Packham. 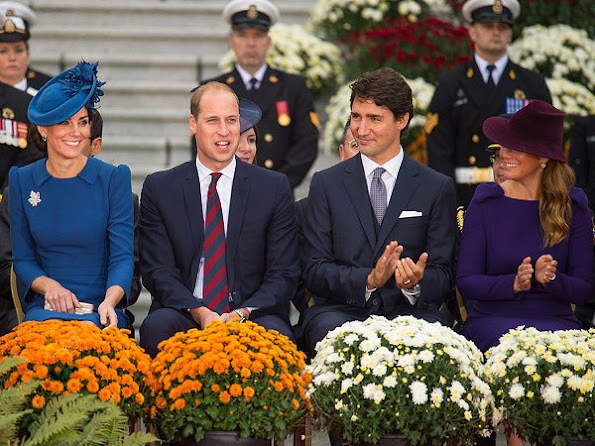 Catherine, Duchess of Cambridge, Prince William, Duke of Cambridge and Canadian Prime Minister of Canada Justin Trudeau and his wife Sophie Gregoire-Trudeau attended the Official Welcome Ceremony for the Royal Tour at the British Columbia Legislature in Victoria, Canada. Tired, jet-lagged, still have to look good and be nice! I think they look good, but I find Kate´s outfit a bit over the top as an arrival outfit. I know they don´t travel economy, and that they probably all changed into these outfits just before descending those stairs, but since it is an arrival outfit, I would have prefered something simpler and more comfortable; not necessarily casual or informal, just a bit less "stiff". Everyone knows they´re travelling with their children - and that alone would call for something more comfortable. They could leave those very formal and strict outfits for when the kids are not with them, or for an official portrait or something. I like how Trudeau is down on his knee to greet George. 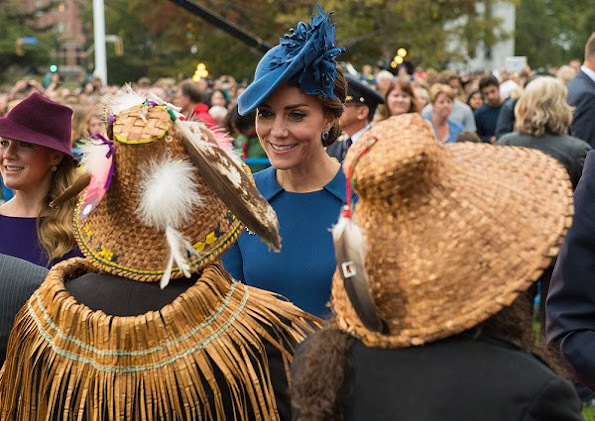 She wore this formal outfit because of the official welcoming ceremony at the British Columbia Parliament Buildings. A 10,000 strong crowd gathered to catch a glimpse of the royals.The Duke and Duchess walk the red carpet to cheers from thousands of well-wishers. She must look impeccable because it was a very busy day for the couple. After the welcoming ceremony, William and Kate returned to Government House where they met with the PM and Gov. Gen David Johnston.The couple also paid their respects by laying a wreath at the Cenotaph at the BC Parliament buildings. Finally,they posed for an official photo with Justin and Sophie Trudeau. 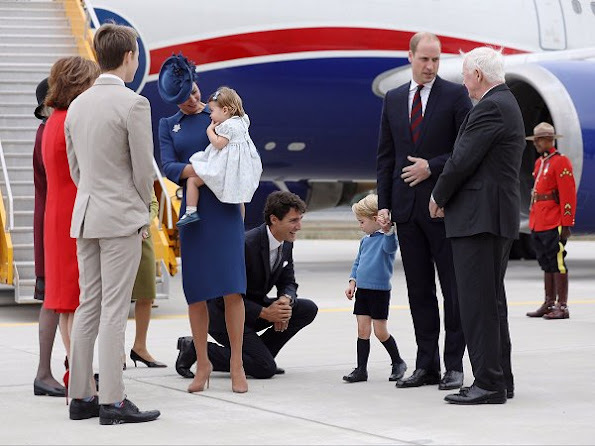 Vanessa, the Duke and Duchess immediately started with their program after the arrival at the airport. Go to website Duchess Kate and you will see why she was dressed like that. Stunning, stylish Duchess Catherine. Dress to the tee and respect the colour of British Columbia flag and Canada in her hat accessories. The children are beautiful and very sweet. Lovely family shots all colour coordinated. Well done to the Duke and Duchess of Cambridge. 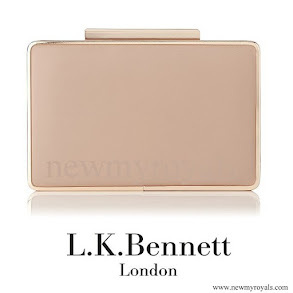 Most beautiful photos and video clips on the website Duchess Kate. The style Princess of the 21st Century!! They all look perfect. 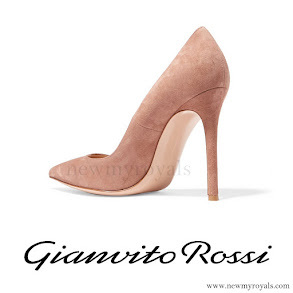 Duchess Catherine so elegant, perfect color for her ! Je suis tellement d'accord avec vous! Enough with the knee high socks already! Honestly George is starting to look silly, his shorts are too short and the whole gender sterotyping that boys always wear blue is just getting redundant. Every time you see him he basically has on the same outfit only it's new clothes. The family coordinated around the look. If he's still wearing them at 13, then yes ! But he's 3 ! For now he looks well turned out, and well behaved ! This is very common dress for the British upper classes. Actually it is quite common for most British children. Catherine tends to stick with traditional dress. What a beautiful,classy & elegant the duchess is!I like this family a lot, they seem a genuine couple with two great children. 1. Charlotte is the spitting image of Carol Middleton! 3. Sophie Trudeau is quite elegant and stylish! Justin Trudeau (my beloved Prime Minister) is the father of three small children so he knows how to interact with kids. I am glad Sophie and Sharon Johnston, the vivacious and charming wife of our Governor General, both elected to wear hats too. It looks polished and proper. Lovely pictures, Dutchess looks very good, every detail has been planned carefully and looks good. Kids are cute. I love how they clothes are all color coordinated. Little Charlotte looks very much like The Queen. Beautiful family, Kate looks mature and chique. It is a good color for her and the dress fits properly. Love it! Kate gave a sartorial nod to her hosts by adding a maple leaf brooch to the dress which is owned by the Queen and was previously worn by the Queen Mother on a royal tour of Canada in 1939.Love it! Both George and Charlotte were impeccably behaved and surprisingly alert given it was midnight UK time when they arrived. Catherine is beautifully dressed--detailed perfectly. 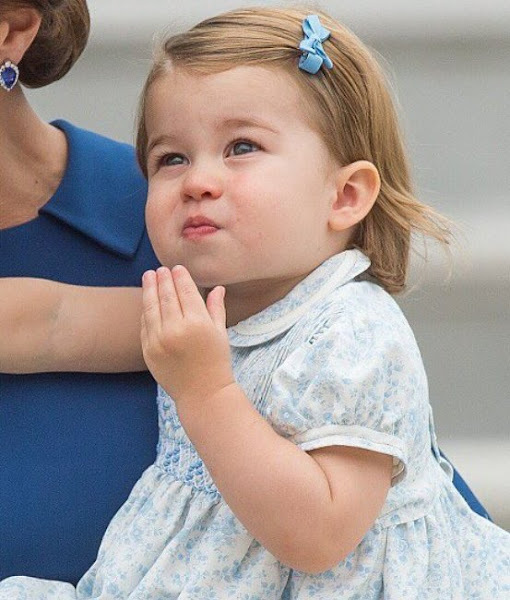 Charlotte looks amazingly like Queen Elizabeth, the closer set eyes, shape of the face, even some expressions--very Windsor. George strongly resembles Catherine's father. Those tanzanite and diamond earrings are gorgeous. Beautiful photos. Catherine looks great and the kids are really cute. Kate's choice of blue came as no surprise , it is one of the colours of the flag of British Columbia . The sartorial tributes didn't end there. 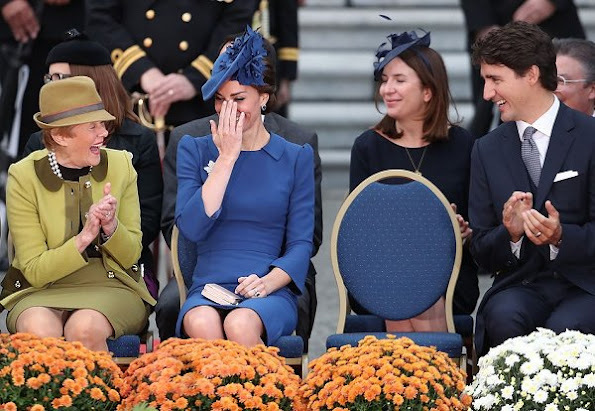 Kate's Lock & Co. hat with maple leaf detailing was another nod to her host country, adding another layer of elegant sophistication to the look and perfectly complemented by a chignon. 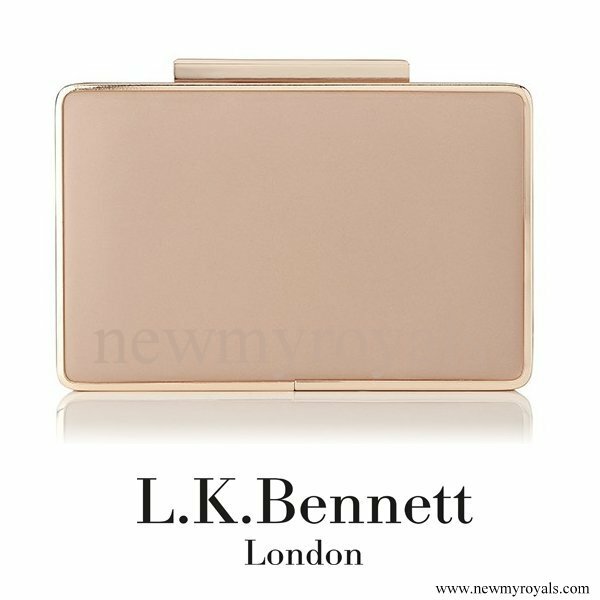 Her Majesty loaned Kate the Maple Leaf Brooch. Beautiful start to the tour! Perfection!!!! Many of her outfits lately have been misses for me but this is just perfect! 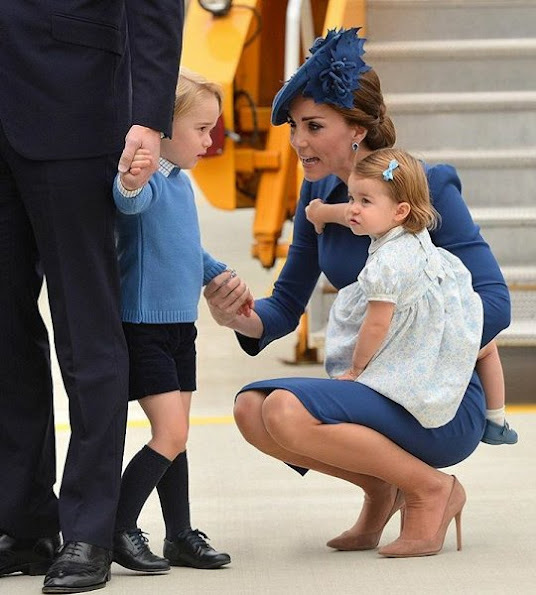 I truly believe we are seeing the reflection of William and Kate's thoughtful hands on parenting and mindful preparation of the children in how adaptable they were, including not being upset by all the people, press, protection officers etc...etc.. Plus I loved how Kate effortlessly bent down to George's level to check on him while still having charlotte on her hip! This little prince & princess have been gifted with wonderful parents who clearly have their priorities straight! What a handsome prime minister! Yes, he is gorgeous and very down to earth too! Lucky Canada and lucky Sophie Trudeau! Duchess looked every bit royalty today ! A mention that Mrs Gregoire Trudeau looked stunning too ! @Royalty fan, we my husband and I thought the same about her high heels and carrying child on her arm not holding to "railing" . It was very unwise of Catherine, one wrong step and she could have end up on her face down on the tarmac... with her daughter! Just spot on! They aced the entire arrival in every arena. Really a beautiful family and very excited to watch it all unfold. Thank goodness for live streaming ! Navy blue color is the most elegant color for everyone. een mooie familie, en schattige kinderen!!!! Love the earrings and the hair. Ensemble is a little to formal for an "arrival" in my opinion, but very elegant otherwise. I wish Kate would take this much care more often. I do not like the old fashioned way Prince George is dressed. I much prefer the way Prince Frederik and Princess Mary dress their children as "normal children". A young boys wearing short pants and long stocks in this day and age, really! They were formal because they went straightaway to a formal event of laying a wreath in honor of veterans. There was a huge welcome ceremony with dignataries and reps from the First Nations. Speeches etc. Everyone was dressed in their best.